Youth Survey: The Parish Council has recently set up a 'Youth Iniiative Committee' to help more fully involve the young people of our village who we know at times feel rather neglected. In the past it has been the responsibility of Essex County Council to cater for young peoples needs but with the closure of our Youth Centre the County Councils policy is to focus on what they see as the area of greatest need and therefore Theydon Bois would not seem to qualify for much help in future. The Parish Council is determined to help fill this gap and together with the Village association has now held a number of meetings with young people and parents to listen to their concerns. The 'Youth Initiative Committee' now wants to extend this process by consulting as many young people in our village as possible and are therefore conducting a 'Youth Audit'. A questionnaire was inclosed with the recently circulated latest edition of Village News but incase you missed this or would prefer to reply by E-Mail we have made a version available on our Web Site. Download the Form (33K), complete it and E-Mail to: theydonboisclerk@supanet.com or return it to the Village Office at the Village Hall. Please do this by Monday, 18th October at the Latest. 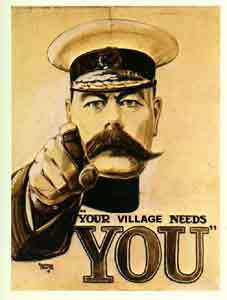 Remember WE NEED YOU. The more young people that reply, the better will we be able to understand your needs. Thank You, your co operation is much appreciated. Apologies: We are sorry for the lack of recent updates to the site. The Editor has been on holiday. Latest Newsletters: We now have Trevor Roberts August review of village events Click Here and Chris Caten's Beat Mobile Nieghbourhood Watch Newsletter Click Here. 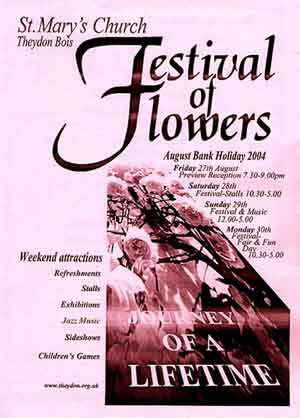 Theydon Bois Bank Holiday weekend was considerably brightened by the bi-annual St. Mary's Flower Festival. The impresive arrangements and the interpretations on the theme of 'Journey of a Lifetime' were throughly enjoyed by all those who saw them over the three days of the festival. The church vestries also had exhibitions about the construction of the new vestries and Theydon Bois & District Rural Preservation Society continued the 'Journey' theme with an exhibition titled 'A Long time in Theydon' showing maps dating back to 1086 and early photographs of Theydon street scenes. They also showed the video made in conjunction with the Primary School of village memories. The whole experience was further enhanced on Sunday afternoon by some life afirming jazz from a band playing in the church grounds and later (when it rained) in the new vestries. Monday was Fun Day with the addition of games, side shows & stalls as well as the lunches & refreshments that had been available over the weekend. For a pictorial view of the displays see our photo gallery. Village News Issue 47: The September issue of Village News is now being distributed around the village and we have the full colour PDF version available on site. Click here. Parish Council Minutes: The July Parish Council Meeting Minutes are now available. Click here. Neighbourhood Watch: We have the latest watch information fro Chris Caten and the Beat Mobile. Click here. The Month in Theydon: Trevor Roberts latest (July) review of village events is now on line. Well worth checking out to find out in greater detail what happened recently. Click Here. Plant a Tree for a loved one. We are planning our next phase for tree planting to enhance our village, it is hoped this will be carried out between this November and next March. In the first phase, completed this March we were able to offer residents the opportunity to have a tree planted in memory of a loved one. This proved to be of great interest, a number of trees were planted and we have a list of those who, have so far, expressed interest for the next planting. The cost this year was £100 per tree including planting and we hope the cost for next planting will be about the same. This does depend on how much the trees cost. If you would like a Memorial Tree please register your Interest as soon as possible. PLEASE HELP TO KEEP OUR VILLAGE CLEAN: The Parish Council liaisons with EDFC in an effort to maintainthe appearance of our verges and regular grass cutting takes place. We do have problems where residents put out sacks and blue boxes on the verges, sometimes days in advance of collection. On occasions sacks are broken into by animals and the contents are strewn around making it look most unsightly. 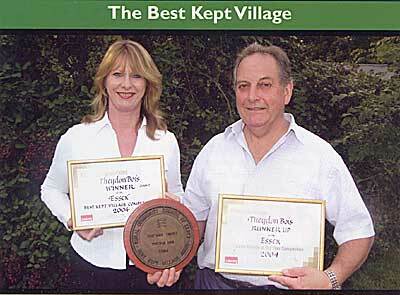 The Village has recently won an award in the Best Kept Village Competition, please help to keep it that way. Please remember bags and boxes should be placed within your property at the front boundary on collection days. Theydon Bois Wins Best Kept Village Award: On 7th July myself (Parish Clerk, Madeleine Murphy) and John Eaton attended the Rural Community Council of Essex AGM in Chelmsford. The RCCE organise the Best Kept Village Competition and the Village of the Year Competition, both sponsored by Calor Gas. There are five categories in BKV according to population, category 1 being the largest. We are category 2. Each group has a winner and a runner up and there are a number of merit awards. To our surprise and delight we won our category, and were runners up in the Village of the Year, narrowly missing a place in the Regional Finals. We were awarded a plaque, 2 certificates and £150 prize money. We will be asking the Village Association if our awards can be permanently displayed in the foyer of the Village Hall. Theydon Bois Primary School: Times Educational Supplement Success. The annual T.E.S. Newsday competition resulted in an overall Curriculum Award for the school. This was awarded for the use of ICT throughout the curriculum and the way in which our newspaper work is incorporated in our planning and curriculum. Children and staff attended a special ceremony at the Houses of Parliament on Friday 18th June to receive the Curriculum Award and then all classes were represented at another ceremony on Monday 21st June when the class awards were presented. At both ceremonies the school was promoted as an example for other schools. Mrs Eleanor Laing met the Monday contingent and gave them a tour of the Palace of Westminster. All the children and staff should be jointly proud of their achievements and hard work. WHILST MOST OF US ARE PROUD TO LEARN THAT THEYDON BOIS HAS RECENTLY BEEN VOTED "BEST VILLAGE" THERE IS ONE GROUP OF RESIDENTS WHO ARE UNLIKELY TO BE IMPRESSED. THIS IS A SMALL GROUP OF YOUTHS WHO SEEM DETERMINED TO MAKE OTHERS LIVES A MISERY. APART FROM THE ABUSE, CONSIDERABLE DAMAGE HAS BEEN CAUSED TO THE BUS SHELTER, THE ROOF OF THE TOILET BUILDING AND THE YOUTH CLUB. WE HAVE LITTLE DOUBT THAT DAMAGE WOULD HAVE BEEN CAUSED TO THE VILLAGE CENTRE IF IT WASN'T FOR THE PROTECTION OF CCTV. 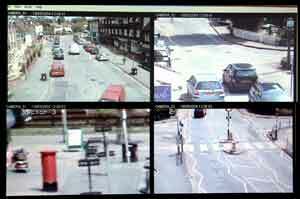 WE ARE NOW MONITORING BEHAVIOUR MORE CLOSELY THROUGH CCTV. A FAVOURITE ACTIVITY IS TO CLIMB ONTO THE ROOFS OF BUILDINGS AND THROW MISSILES AT THE SURROUNDING PROPERTIES. EVEN MORE WORRYING IS THE FASCINATION WITH THE GAME OF CHICKEN WHEREBY THE AIM IS TO SUDDENLY RUN, CYCLE OR SKATE BOARD IN FRONT OF PASSING CARS. IT IS PROBABLYONLY A MATTER OF TIME BEFORE A CHILD IS KILLED OR SERIOUSLY INJURED BY THESE ACTIVITIES. PREVIOUSLY RESIDENTS HAVE BEEN ASKED TO NOTIFY THE POLICE AND THE PARISH COUNCIL OF ANY SERIOUS INCIDENTS OF ANTI-SOCIAL BEHAVIOUR AND THROUGH THIS THE IDENTITY OF MANY OF THE MAIN TROUBLE MAKERS IS NOW KNOWN AND MOST OF THEM LIVE IN THE VILLAGE. ALTHOUGH THE POLICE OFTEN HAVE INSUFFICIENT RESOURCES TO RE-ACT TO ALL CALL OUTS, PLEASE CONTINUE WITH THIS PROCESS. A NUMBER OF ANTI-SOCIAL BEHAVIOUR ORDERS ARE BEING CONSIDERED ON YOUTHS IN THE VILLAGE AND THERE IS OBVIOUSLY SCOPE FOR MORE. FOLLOWING ON FROM THIS THE POLICE HAVE NEW POWERS TO DEAL WITH FURTHER INDISCRETIONS. THIS COULD INCLUDE ACTION AGAINST PARENTS. THE PARISH COUNCIL KNOW THAT THE VAST MAJORITY OF THEYDON BOIS RESIDENTS ARE DECENT LAW ABIDING CITIZENS WHO TAKE PRIDE IN OUR VILLAGE.MOST PARENTS FULLY DISCHARGE THEIR RESPONSIBILITIES AND MOST OF OUR CHILDREN ARE WELL BEHAVED. HOWEVER, AS USUAL THE ACTIVITIES OF THE MINORITY ARE TARNISHING THE REPUTATION OF THE MAJORITY. THIS MINORITY ARE,NO DOUBT, AWARE OF THEIR RIGHTS BUT HAVE NOT LEARNED THEIR RESPONSIBILITIES. WE ARE AWARE THAT ORGANISED YOUTH ACTIVITIES ARE IN SHORT SUPPLY AND A NUMBER OF MEETINGS AND A YOUTH AUDIT HAVE BEEN ARRANGED TO SEE IF THERE IS SCOPE FOR NEW FACILITIES. HOWEVER LACK OF FACILITIES IS NO EXCUSE FOR BAD BEHAVIOUR, THAT IS CAUSED BY LACK OF RESPECT. YOUR PARISH COUNCIL ARE PREPARED TO USE THE FULL FORCE OF THE NEW LAWS TO RECTIFY THE CURRENT SITUATION BUT BEFORE DOING SO WE WOULD LIKE TO APPEAL TO ALL OUR YOUNGSTERS TO BEHAVE IN A RESPONSIBLE MANNER AND TO ALL PARENTS TO ENSURE THAT THEY ARE AWARE OF EXACTLY WHAT THEIR CHILDREN ARE DOING WHEN OUT IN THE VILLAGE. IF THEY ARE OUT AT NIGHT ARE THEY INVOLVED IN OR EXPOSED TO THIS PROBLEM?. FURTHER MEETINGS WITH PARENTS ARE PLANNED BUT IN THE MEANTIME ANY PARENTS WISHING TO DISCUSS THIS ISSUE SHOULD APPROACH THE COUNCIL VIA THE PARISH CLERK. Open Gardens Day: It was another successful year with only a thunderstorm at the end spoiling a magnificent sunny occasion. The event was organised, for the tenth successive year, by Joy Wainwright who had spent much time since before the last Christmas in preparing for the Day. The proceeds from the event amounted to some £2,345 to date, which was divided equally to help fund the Village Hall CCTV Cameras project and support the Pat (Playground At Theydon) charity. We have some pictutres from this year and the previous years on our Galleries Page. Shopping in Theydon Bois: The original shopping centre in Theydon Bois was situated either side of the old 'Cabin' which stood on the corner, adjacent to Wood and Krailing's garage (opposite the Bull public house), at the junction of Forest Drive and Coppice Row. Unfortunately, both establishments have disappeared. The shopping centre once provided the residents of Theydon Bois with all their shopping requirements. We had a fresh fish shop, two bakers, two butchers, two green grocers, a wool shop and drapers and a wonderful delicatessen which between and after the wars, supplied village residents as well as London based brewers directors dining rooms, with excellent specialised delicatessen. The advent of supermarkets has provided customers with once a week, one stop shopping opportunities. However, this has had a detrimental affect on the well being of the village community as well as detracting from the number of village based retailers some of which have already disappeared over recent years. To remind you they are, a green grocers, a wool shop, a drapers, two bakers, a florist (although we are glad to see Theydon Bakers and Venus Flowers taking their place). Small retailers are struggling to survive in some circumstances. From a purely selfish view point, the worst case scenario that one could imagine for our village centre and the village as a whole, would be for a number of shut up, boarded-up and graffiti ridden business premises. This would detract from the village centre, encourage further anti-social behaviour and probably have a bearing on house prices in the village. The advent of Tesco's Express store has brought new people to Theydon Bois but they do not bring prosperity to other shop-keepers and have spawned several other problems attendant to their presence in the village. We are talking to the management of Tesco's and they have been sympathetic to our cause especially with regard to our efforts to regain Best Kept Village status. Our concern as a Parish Council is to support those old businesses and I ask you to consider giving those businesses your support. In this edition of Village News, I would like to bring to your attention two of the original retailers in the village. Spar Grocers and Market Garden, formerly Quality Fare. Spar Grocers is run by Bibin Patel. He took over from Mr. Baxter (remember him? ), in 1978. He currently carries a wide range of groceries, high quality frozen goods and associated household goods at very competitive prices. Spar's 'Heritage' branded goods include excellent dairy, sausage and cured meats products, all of which I can recommend. Bibin offers free deliveries direct to your house and is open Monday to Saturday 8am - 7.30pm and Sunday 8am - 1.30pm. Market Garden has seen a number of owners since the departure of the owners of what was then know as Quality Fare, Eddie and Jill Littler. The shop has been under new management since 8 May this year. Conscious of the need to provide fresh green grocery every day of the week, current owner, Stephen Wolfus, has endeavoured to find fresh suppliers and contracts to see that his produce reasonably priced and is moved on quickly. He currently supplies Theydon Bois Primary School with fresh fruit and vegetables for the children's dinners, following the cessation of Essex County Council's provision for schools dinners in spring this year. He has fresh fruit and vegetables daily, provides free local deliveries, and is will negotiate to supply contract orders. He is open 7am - 5pm Monday to Saturday with ½ day closing on Wednesday. You can contact him on 01992 812792. Both these retailers in addition to all the other local retailers, need our support in the light of strong competition. Remember the old adage, "If you do not use them, you will loose them". They are all very nice people looking forward to serving you with a smile - please support them. Royal British Legion seek Bugle Player:Wanted A bugle player (male or female) to play the last post at our Royal British Legion Services of Remembrance at the War Memorial, Coppice Row. This year it is being held on Sunday 14th November 2004 starting at 10.45 a.m.. Replies please to Harry Memory, telephone 01992 812696. Royal British Legion: The Annual Royal British Legion Service of Remembrance will take place on Sunday 14th November starting at the War Memorial at 10.45 a.m. and then continuing in the Church. In the event of wet or bad weather the entire service will be held in the Church. Medals may be worn and Standards carried. Would Legion Members and other adults please form a line on the pavement facing the War Memorial and the younger people congregate on the sides of the Memorial area and in time for the start of the service. 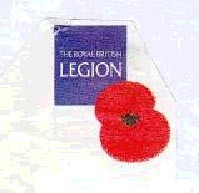 The Royal British Legion is a charity whose work is to help disabled service and ex service personnel and their families. Please give generously when you see the poppy sellers around or if they call on you at your home, and please do 'Wear your Poppy with Pride'. Armistice Day Thursday November 11th at 11.00 a.m. Please pause for 2 minutes 'Just to Remember'. LOCAL SERVICE SURGERIES - The Pension Service is part of the Department for Work and Pensions. It has been set up to improve the service to people who are already pensioners, or those planning their retirement. "Meet us to find out more". Essex Mobile Police Van (Outside Village Hall 10.00-12.00am) - Thursday 1 July, 9 September & 16 December. For further information about your nearest surgery please phone 0845 60 60 265 and ask for the Local Pension Service. More Dates for Your Diary: We will be adding these dates to our Diary Page closer to the events but you may wish to make note of them now. 20th November - Loughton Friends of St. Clares Hospice. Band Concert at 7.30pm in the Village Hall. 25th November - Parish Council Meeting. 8pm in Village Hall. 3rd December. Lighting the Christmas Tree at 6.30pm. Santa is coming! Theydon Bois Playgroup: is situated in the Scout Hut in Loughton Lane. Pre-school children from the age of two and a half meet to enjoy National Curriculum based activities, song and play. As the majority of the playgroup children progress onto Theydon Bois Primary School, the friendships formed at playgroup help the children to settle into the school environment. Children can attend as many or as few sessions as they wish (space permitting). As they get older, they are offered full day sessions on Wednesdays and Fridays. This is beneficial as it teaches the children lunch box skills and helps them adapt to school life. The playgroup has recently passed its Ofsted Inspection and is thought to be a friendly, popular and relaxed asset to the village. Be sure not to miss the stunning flower displays this year on the theme of a "Journey of a Lifetime" together with the exhibitions in the church. The Church Hall will host stalls & refreshments on Saturday & Monday which is also 'Funday'. There will also be live Jazz in the Church Grounds on Sunday from 2.00pm - 5.00pm. For more details & the full programme Click Here. 7.30pm - 9.00pm. Evening Preview Reception. Tickets £5.00 from Roy & Joan McLean Tel: 01992 812187. Flowers & Exhibitions. Jazz on Sunday from 2pm - 4.00pm. Youth Centre Decision: After a wait of over seven months the application by Essex County Council for Outline Planning Permission for the Youth Centre site finally came before the EFDC's Area Plans Sub-Committee on Wednesday night (21st July). A large number of village residents were in the council chamber to monitor the proceedings and support the official objectors. Only three people were allowed to speak to the application and for three minutes only. Jim Watts of Theydon Bois & District Rural Preservation Society represented them and the Residents Against the Youth Centre Closure. John Eaton represented the Parish Council both these objecting to the proposal. An Agent spoke for Essex County Council, supporting the application. Although the Planning Officers had put in a high number of conditions, 15 in total, in connection with the application they had still recommenced approval to the councillors. John & Jim both pointed out that the County Council had in fact allowed the Youth Centre to decline so that closure had become a self fulfilling process. Lots of assumptions had been made about alternative provision with out any supporting evidence. The assumptions that residential development would result in less traffic movements were flawed and crucially that no proper assessment of Open Space & Associated Facilities ,as required under planning provision PPG17, had taken place. The Agent for Essex County Council pointed that the closure decision had already been made and the authority was in its right to seek residential use for the site. Councillors Glozier, Whitehouse, Rush all spoke eloquently against the application, questioning the Planning Officer on a number of points and noting (as pointed out by John) that really this land had been given in trust for the use of the community by the Buxton Trust and that the County Council were operating unethically if not illegally. Cllr. Glozier also pointed out that a recent legal decision in Sunderland could mean that the land could be designated 'Green Space'. The application was then put to the vote and the councillors voted unanimously to reject the application on the grounds that no proper assessment under PPG17 had taken place and that the Highways Dept. had not produced supporting evidence on traffic movements. Speaking after the meeting Jim Watts said that although very pleased with the outcome and the support shown by councillors this decision did not effect the one to close the Youth Centre, which had already been made separately. Clearly Essex County Council would try to come back in the near future with a revised application after carrying out some form of assessment. We had to be prepared for this and look to ways of challenging it by seeing how we could maximize the use of the site. We also needed to keep up the pressure on the authority to provide proper youth provision for our children. Theydon Bois Wins Best Kept Village Award: Last night myself (Parish Clerk, Madeleine Murphy) and John Eaton attended the Rural Community Council of Essex AGM in Chelmsford. The RCCE organise the Best Kept Village Competition and the Village of the Year Competition, both sponsored by Calor Gas. There are five categories in BKV according to population, category 1 being the largest. We are category 2. Each group has a winner and a runner up and there are a number of merit awards. To our surprise and delight we won our category, and were runners up in the Village of the Year, narrowly missing a place in the Regional Finals. We were awarded a plaque, 2 certificates and £150 prize money. We will be asking the Village Association if our awards can be permanently displayed in the foyer of the Village Hall. Parish Council Committees: Our listing of the Parish Council committee responsibilities have now been updated following the recent election of the Parish Council for 2004 & 2005. So do see who is doing what Click Here. Open Gardens Day: It was another successful year with only a thunderstorm at the end spoiling a magnificent sunny occasion. The event was organised, for the tenth successive year, by Joy Wainwright who had spent much time since before the last Christmas in preparing for the Day. The proceeds from the event amounted to some £2,345 to date, which was divided equally to help fund the Village Hall CCTV Cameras project and support the Pat (Playground At Theydon) charity. We will be adding some pictures of the gardens open this year soon. In the meantime check out the previous years on our Galleries Page. Youth Centre Meeting: Epping Forest District Council Area Plans Subcommittee meet on Wednesday 21st July at 7.30pm to consider the outline planing application for the residential development of the site of the Village Youth Club in Loughton Lane. The Parish Council, Theydon Bois & District Rural Preservation Society and Residents Against the Youth Club closure have all lodged objections to this planing application that suggests that 10 houses can be built on the site. Essex County Council are still determined to close the club in August and will not at present offer any alternative inspite of the need for somewhere for the young people of the village to meet. If we are to have any hope of reversing that decision or offering another (better use) for the site we need to see that this application is rejected. Only one person will be allowed to speak in objection to the application but the presence of a large number of village residents at this meeting will add weight to the objectors arguments. If you value this important village resource please try to attend the meeting in the Council Chamber at the Civic Offices, Epping. Royal British Legion seek Bugle Player:Wanted A bugle player (m or f) to play the last post at our Royal British Legion Services of Remembrance at the War Memorial, Coppice Row. This year it is being held on Sunday 14th November 2004 starting at 10.45 a.m.. Replies please to Harry Memory, telephone 01992 812696. The Month in Theydon: Trevor Roberts latest (June) review of village events is now on line. Well worth checking out for to find out in greater detail what happened last month. Click Here. generated a Roman atmosphere, which transported the audience from an English garden to Rome itself for the assassination of Caesar, the only distraction being the noise generated by a low flying aircraft. At the conclusion. remained regarding the closure, which, he contended, was purely a commercial decision made by the ECC to sell the site. Moreover, this had possibly resulted in Theydon Bois losing a Conservative seat on the EFDC to College Governor Kay Rush who stood for election as a Liberal Democrat. The ECC was concerned about the adverse reaction the closure had generated eg. in the Press, on Television and even in Parliament. John therefore asked all those present to continue pressing their objections whenever and wherever possible. The College was now busier than ever with new and regular students and the record attendance today was an example of the College's reputation and viability. Village News Issue 46: The June issue of Village News is now being distributed around the village and we the full colour PDF version available on site. Click here. Parish Council Minutes: The May Parish Council Meeting Minutes, which contain details of how the controversial decision to reject the Tennis Club Lighting was arrived at are now available. Click here. Country Dance Club: We may still be enjoying the start of the summer (hopefully) but Theydon Bois Folk, Country & Barn Dance Club have been busy preparing their autumn programme and these are now on our Club Details Page. This friendly club has grown in popularity recently but still welcome new members. Why not check them out next season. First visit is free. Bridge Evening at the Village Hall. there were kids with high spirits then, but their crime was little more than naughty pranks or scrumping. Today, we are gathered to make the official launch of the new CCTV system in the Village centre, necessitated by the ever increasing levels of juvenile arrogance, contempt for authority, lack of respect for peoples property, lack of pride in the village and worst of all their apparent belief that nobody can touch them. If there is to be a celebration today, it is that we hope passionately that today will mark the end of this wanton intimidation and anti-social behaviour. Not only do we hope that we can identify the relatively small band of youths who are the troublemakers and bring them to book, we hope to proactively use the cameras as indisputable evidence to trap those parking illegally and those of all ages behaving in an antisocial manner in public. In a way, a much welcomed new beginning. Out thanks must go to the support we have received from the Vandalism and Antisocial Behaviour Group, from which I think it correct to say, this CCTV installation was spawned. I would also like to thank Simon Ford of EFDC for the contribution he has made to this venture and also the funding. We received a £5,000 grant towards the cost of CCTV from Epping Forest District Council. I would like to mention the following people who have made a major contribution in moving this project from drawing board to implementation. Without their help we could not have succeeded and our sincere thanks go out tot them. Tony Ellis, Safer Communities and Sue Purkiss, Community police officer, - Essex Police. AVS, CCTV Equipment Suppliers, and particularly Scott who has been of tremendous support to the Council. Diana Ingram and David Norman, both of whom have very kindly agreed for CCTV equipment to be fixed to their property. Those on the Parish Council who have given so much of their time on the CCTV project. Lastly, as we were proposing to spend public funds on this project, Peter Gooch, Ken Cushing and Ron Smith, who undertook a Peer Group Review to corroborate John and Roberts finding prior to the final decision being made. The Parish Council would also like to express its thanks for the support it has received from other Village associations, particularly the Village Association and Playground at Theydon." Four Years of the Parish Council: With the elections due on Thursday 10th June Parish Council Chairman, John Eaton has written an overview of the past four years which is on our Council News Page. Theydon Bois Music Society: The Theydon Bois Music Society have made an early announcement about their 2004/5 season programme which starts on 9th September at the Village Hall at 8.00 PM The opening concert is Alison Gillies  Cello with Piano accompaniment. The Society has vacancies for new members and if you have an appreciation of good music in good company then why not join us. Concerts are on the second Thursday of the month, September to June.